Unnamed US officials are telling Associated Press that their intelligence suggests Malaysia plane shot down by anti-Kiev militia, no link to Russia found. Officials believe that the passenger aircraft was intercepted by an SA-11 surface-to-air missile, which was fired by Ukrainian militia members. One official said the likeliest explanation was the aircraft was shot down in error, an assertion that seem to be bolstered by the previous downing of 12 Ukrainian military aircraft by militants in the region. Intelligence suggests that, although the US maintains that Russia "created the conditions" that led to the incident, officials were not aware of the presence of any Russians during the missile launch, and would not confirm that the missile crew was trained in Russia. The crash of the airliner last week with 298 passengers aboard has only exacerbated the row between the US, European powers and Russia over the developing situation in eastern Ukraine. 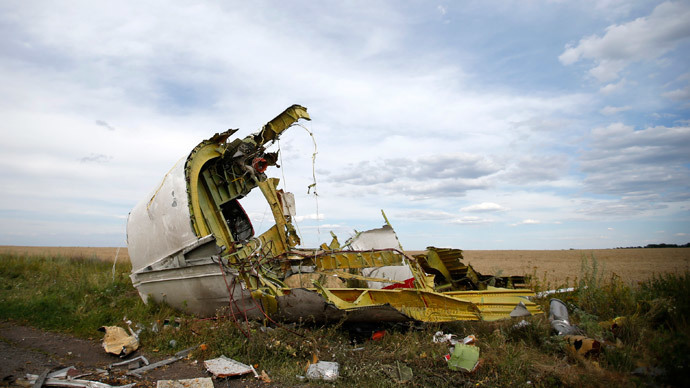 The aircraft’s black boxes were turned over to Malaysian authorities late Monday night by Ukrainian militia. Access to the debris field, which is located within the restive Donetsk People’s Republic, has been limited and rumors have run rampant regarding the conduct of militia in the area. One official said that, regarding as to who precisely fired the missile, "we don't know a name, we don't know a rank and we're not even 100 percent sure of a nationality." The official added that "there is not going to be a Perry Mason moment here," referring to any likely absence of definitive conclusions. 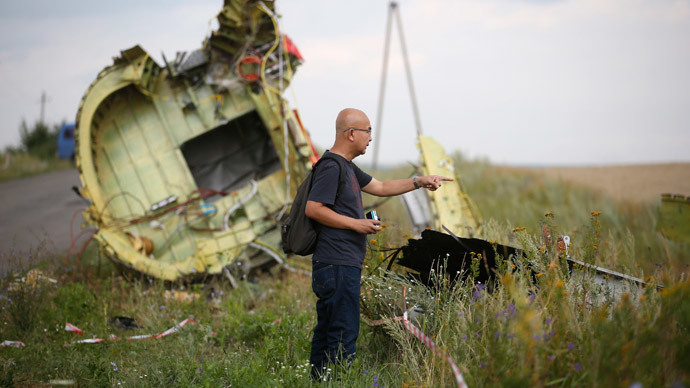 The Tuesday briefing seemed to be a sharp departure from comments made by US President Barack Obama a day prior, who stated that the Malaysia Airlines aircraft had been “shot down over territory controlled by Russian-backed separatists” that had been both armed with anti-aircraft weapons and trained by Russia. On Monday State Department Deputy Spokesperson Marie Harf was asked whether the US could back up claims that "common sense" indicated Ukrainian militia had shot down the Malaysian Airlines plane, along with evidence provided by social media. Harf responded that there was a "host of information" gathered by US intelligence on the incident. “I certainly am blaming the Russians for the pro-Russian separatists’ behavior in general, but we need to get all the facts about this specific incident. We don’t – I don’t want to go out there and put culpability on anyone until we have all of those facts,” Harf told journalists. The Russian military has presented information that a Ukrainian SU-25 fighter had been gaining altitude in the direction of the Malaysian Boeing prior to the catastrophe. According to military monitoring data outlined by chief of General Staff of the Armed Forces Lt. Gen. Andrey Kartopolov along with chief of the Air Force Main Staff Lt. Gen. Igor Makushev this week, Russia is concerned about a number of unanswered questions surrounding the downing of the jet. 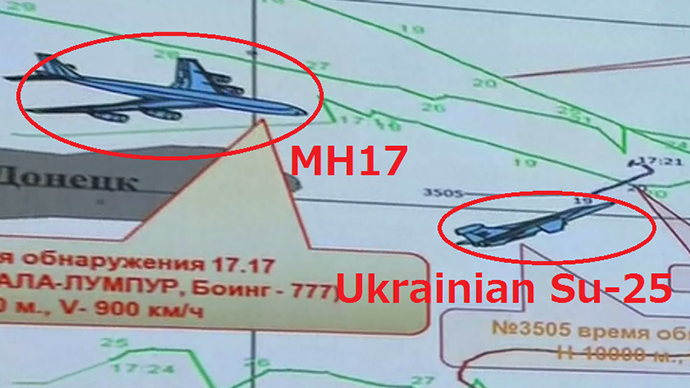 "Russian monitoring systems registered that there was a Ukrainian Air Force jet, probably Su-25, climbing and approaching the Malaysian Boeing," said Kartopolov. The Russian military has also prompted Kiev to explain why MH17 seemed to deviate from its flightpath after reaching Donetsk, out of the international corridor over the country's airspace, and why Buk missile systems had been deployed on the edge of militia-controlled territory by Ukraine prior to the plane's downing. Despite earlier claims that the media would be presented with unclassified evidence from intelligence sources, unnamed Obama administration officials mostly reiterated earlier claims based on social media posts and unverified audio and video recordings published by Ukrainian government.